This document outlines overview of ChARM EHR 'Realtime Eligibility Inquiry' feature. 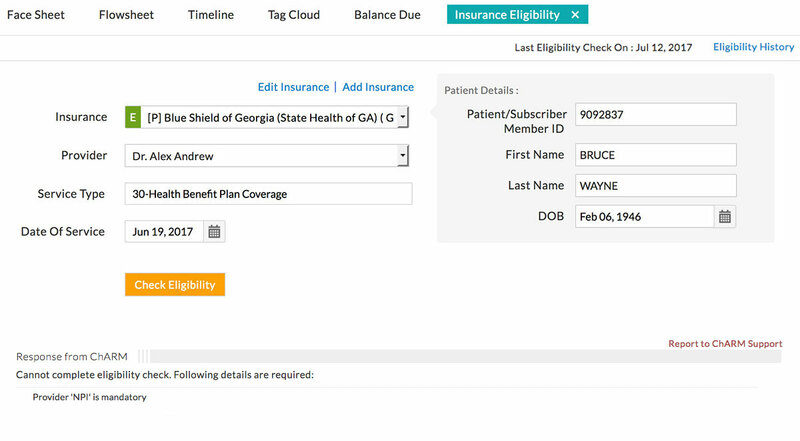 ChARM uses Optum EDI to get the patient insurance eligibility information. 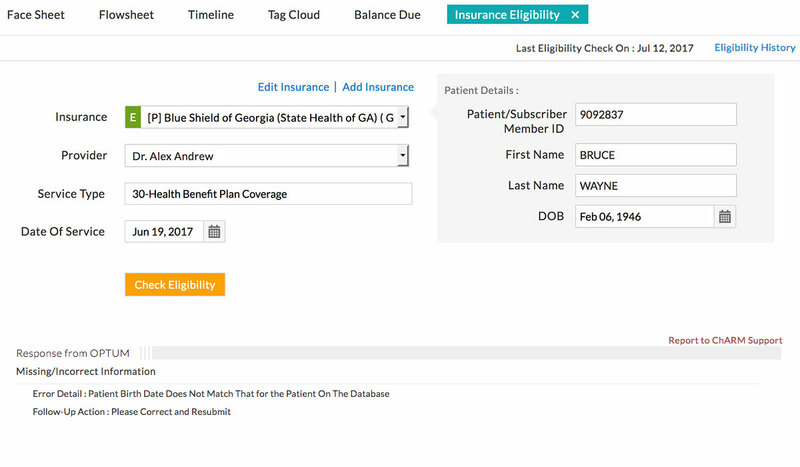 This feature will be enabled only to the practices signed up with Optum with a suitable plan to use this feature. 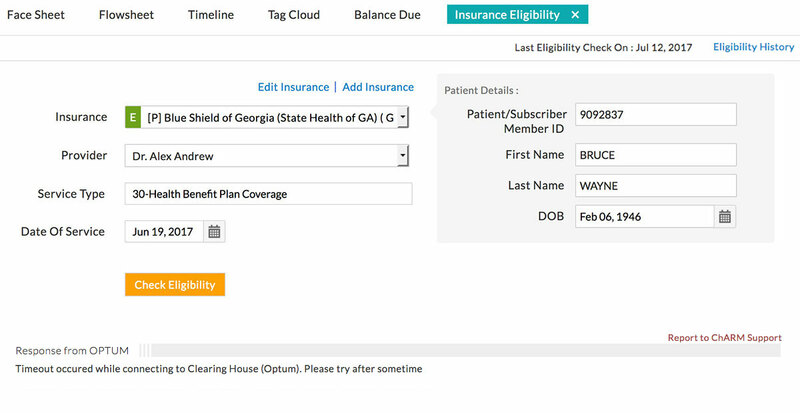 ChARM uses Optum EDI service to get the patient insurance eligibility information. 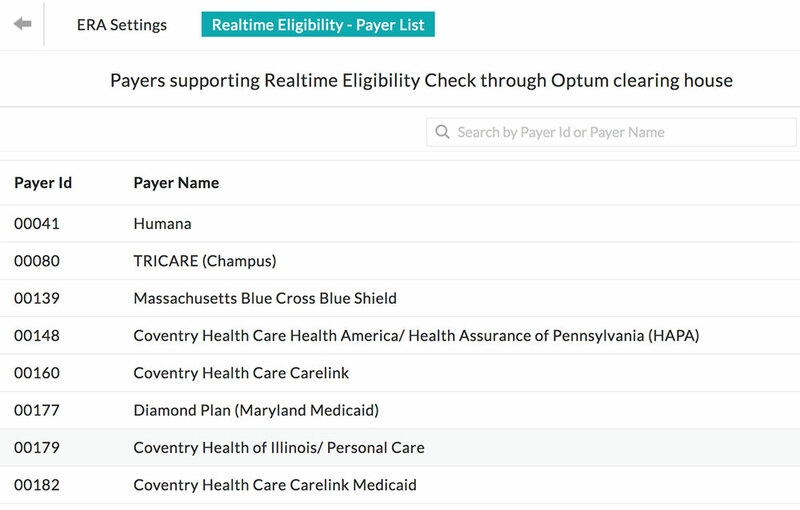 List of payers supporting real time eligibility request is available under 'Settings > eClaims > Realtime Eligibility - Payers List'. Payers can be searched using Payer Name or Payer ID. 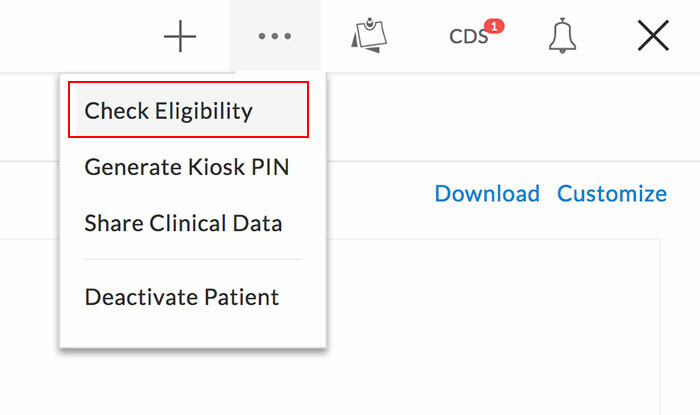 For the practices enabled with this feature, 'Check Eligibility' link will be enabled in the patient's dashboard 'More Options' (...) icon of the top header. Insurance selection: All the Patient Insurances added earlier will be listed here. Payer name is shown in the drop down along with "Eligibility Supported" or "Eligibility Not Supported" text. This additional text indicates whether eligibility check is supported for this payer or not. Add Insurance & Edit Insurance - Option to Add new insurance and Edit selected insurance is provided in this page. Patient details are shown in the right hand side, which will be sent in the eligibility request. 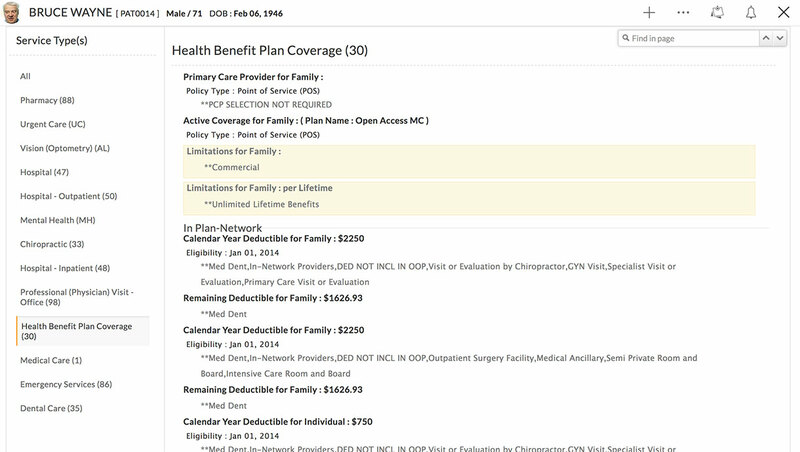 Using these details, payer database will be searched for the patient insurance. Hence these patient details are called search options. Some payers need patient additional details such as SSN, Medicare ID, Card Number etc. Providers (Eligibility response receiver) list shows all the providers and the facilities in the practice. All the past eligibility benefit details will be listed in chronological order. Selecting any past eligibility request from the list will show the respective eligibility detail. Missing/Incorrect Information: Optum will respond with the benefit information, if there is matching insurance details for the patient. Failing which, Optum responds with error message. Following is one such error case. In this case, patient name and date of birth (DOB) in the demographics is not matching with the payer database. 'Insurance Eligibility' link is also provided in appointment list view for easy verification of the eligibility details by the front office.